How can I even begin to describe the power of these “Holy Schist!” Ruby Corundum Stones? 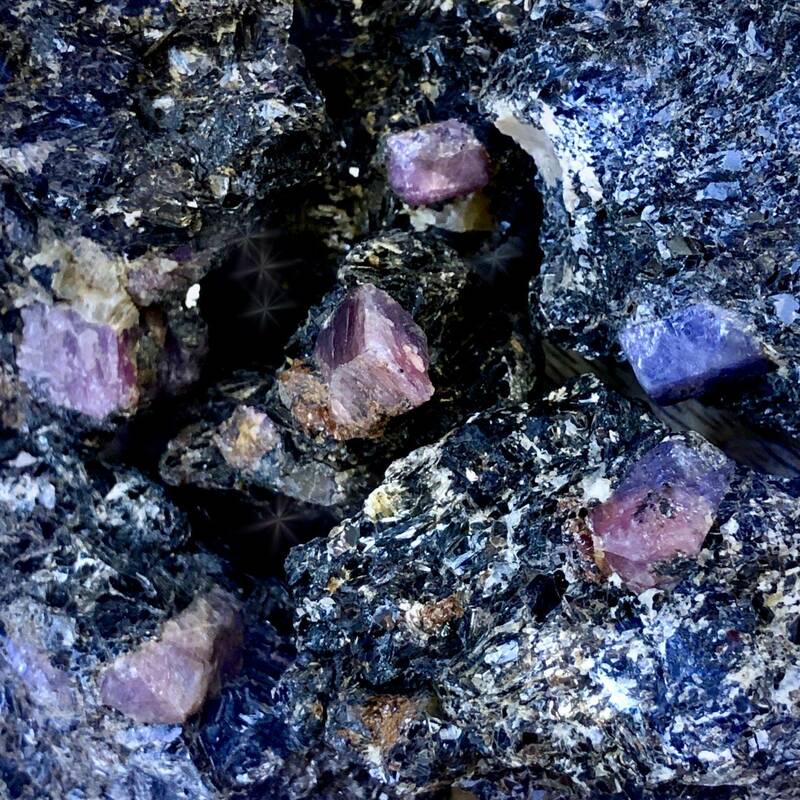 These magnificent specimens are ruby corundum and blue and purple sapphire in biotite mica schist and are reverberating with transformative healing power. If you’re looking to revitalize your spirit, clear energetic blockages, and powerfully boost your Chi, or Life Force, these stones will be your guide. Incorporate these beautiful gems in meditation, ritual, crystal gridding, or simply place them in your sacred space to begin calling forth their extraordinary energy. Or, have your piece wire wrapped as a pendant, to keep its medicine close to your heart. However you use it, this is BIG MAGIC! Anyone who knows me knows that I absolutely adore ruby. This stone is passionate, yet grounded and fierce. It connects you deeply with the Earth and unlocks your inner well of passion and Divine Love. This gem is known for its extraordinary ability to boost Life Force – it does so by infusing the Root Chakra with the healing light of the Red Ray, then sending that vibration upward throughout the body, bringing a wonderful sense of vitality, stability, and strength that runs from Root to Crown. Astrologically associated with the planet Saturn, sapphire is a powerful aid for gathering your thoughts and bringing them to fruition; place one at your Third Eye Chakra to experience an intuitive awakening, increased inner strength, self-confidence, and psychic abilities. Sapphire also opens your Throat Chakra for expressing your innermost truth with conviction and clarity. 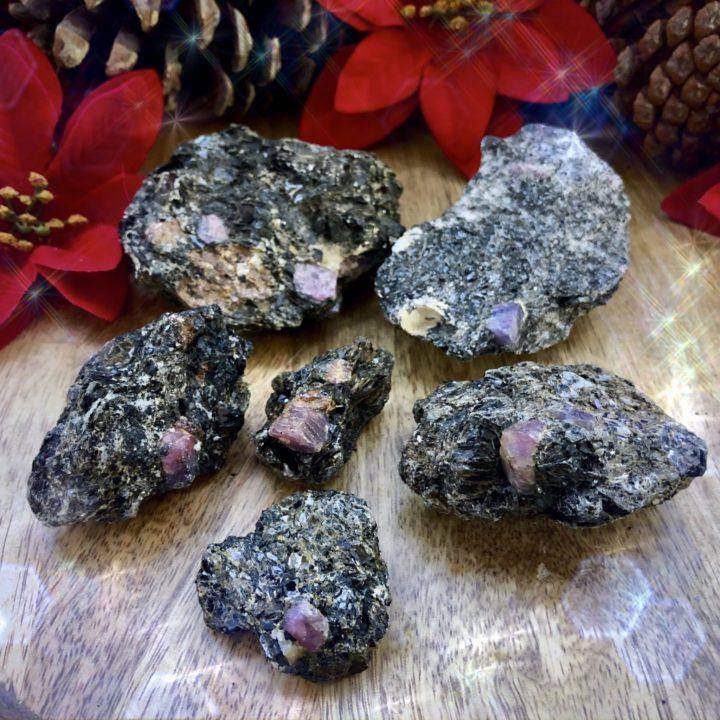 Biotite mica schist is a Life Force healer and booster. If you’re feeling run down, as we all do from time to time, it will pick you up and put you back together. Biotite mica also brings forth purification, centeredness, grounding, and mental and spiritual clarity. Work with this gemstone to uncloud your vision, so that you may see the truth in all situations, and to clear blockages within the auric body. 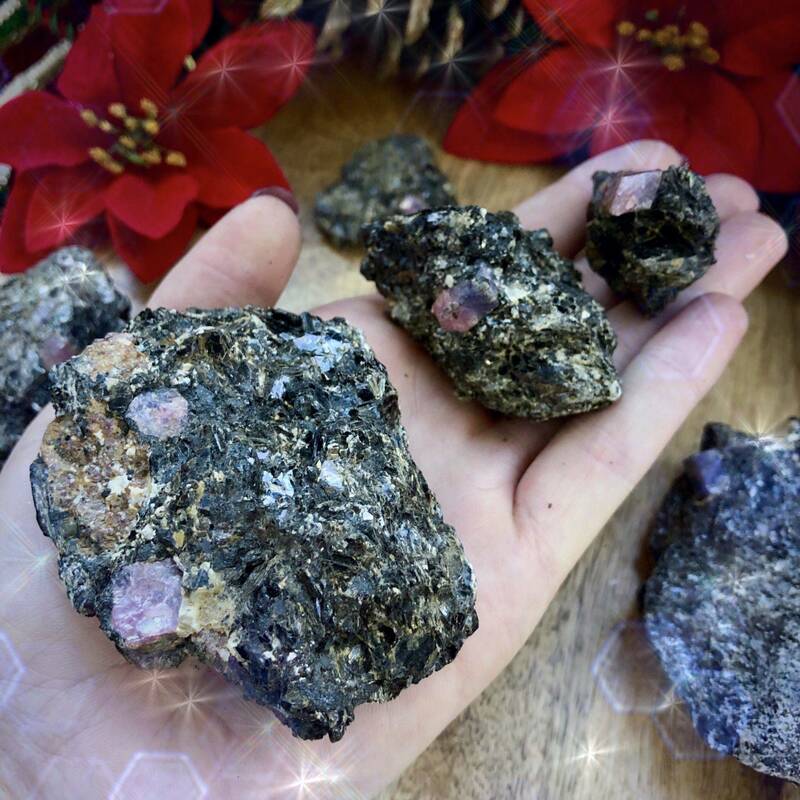 These “Holy Schist!” Ruby Corundum Stones will pull you into alignment with your highest, healthiest, and happiest self, and will serve as wise guides on the path toward your Highest Good. This listing is for one (1) “Holy Schist!” Ruby Corundum Stone. I have three sizes to offer you: Small (about 1-2”), Medium (about 2-3”), and Large (about 3-4”). Yours will arrive lovingly parceled along with a single leaf of white sage and a card describing the properties of the stone.